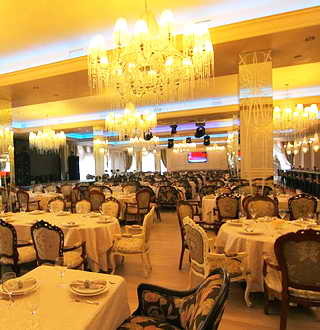 Atlantic Hotel (positioned on 4 stars) opened in 2013 is located in one of the resort areas of Odessa - Arcadia. 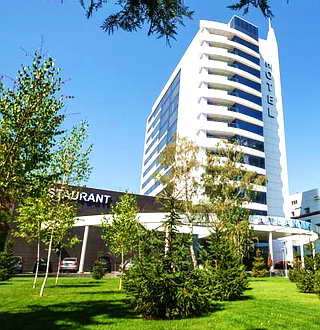 Location of the hotel allows guests to stay near the Arcadia Beach, next to the Victory Park and a 10-minute drive to the city center. 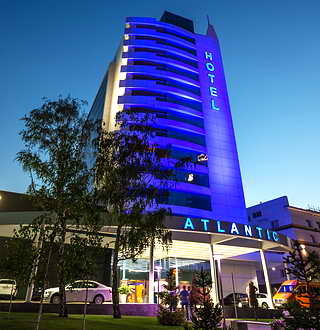 The Hotel can offer its visitors all sorts of services, such as: restaurant, bar, nightclub 'Atlantic', beauty salon, guarded parking, luggage storage, ATM. 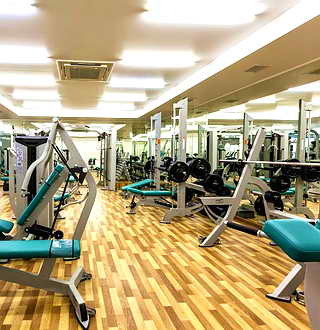 The fitness center includes indoor pool, a gym, Finnish sauna and Turkish Hammam. 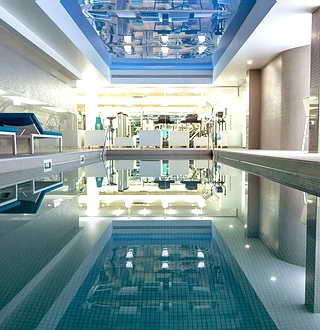 The hotel is equipped with a modern ventilation system and boiler, for trouble-free heat and hot water. Safety is ensured by the 24-hour security service. 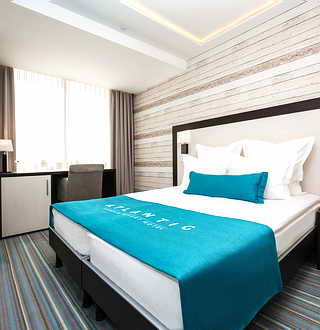 Atlantic Hotel has 106 comfortably furnished rooms of different categories - 14 two-room Suites, 45 Junior Suites and 47 Standard Rooms. 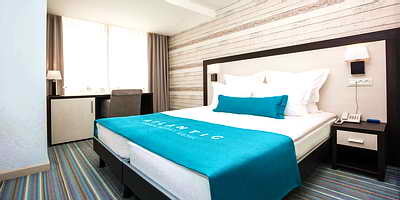 All rooms of the Atlantic Hotel are equipped with LED TVs with Smart TV function, free Wi-Fi Internet, ventilation and air-conditioning sistem, telephones, mini-bars, mini-safes, hairdryers, bath amenities. Bathrobes and slippers in all rooms except the standard. All the rooms have beds of Italian production with orthopedic mattresses and anti-allergic pillows and duvets. 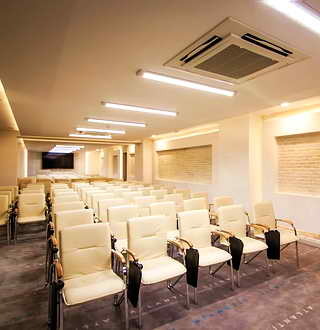 For holding conferences there is a 3 comfortable Conference Halls (for 50, 85 and 100 persons) equipped with all conference equipment. 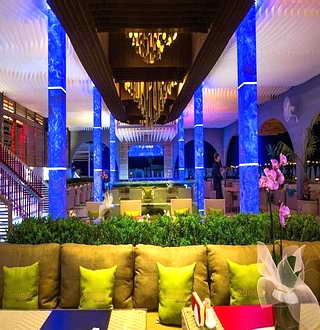 The guests of the Atlantic Hotel may have free-of-charge entrance to the best Odessa night clubs Atlantic and Itaka (except concert days) and discount 50% for visiting to VIP beach club Itaka located in Arcadys. Breakfast not included in room rates. 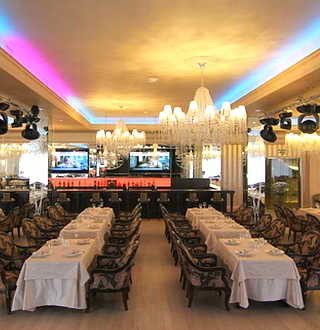 For the payments can be used credit cards Visa Card, Master Card, Euro Card. 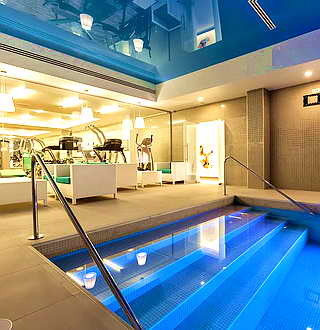 DISCOUNT -10% FOR ALL ROOMS!!! 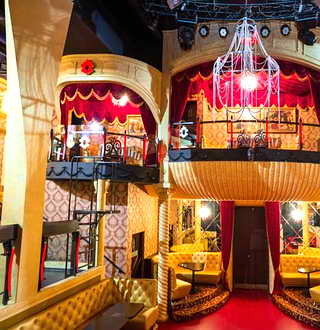 Free entrance to the night clubs Atlantic and Palladium (except concert days)! The promotional prices are valid for accommodation 01.10.2018 - 01.05.2019! When booking in the additional wishes please write name of this special offer. 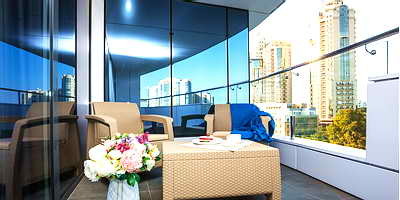 Оne room Junior Suite with terrace. 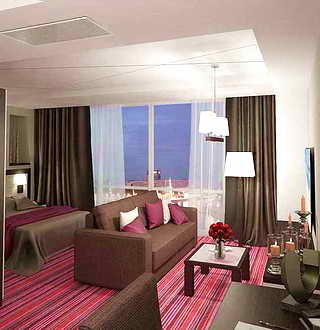 Double bed, folding sofa, a SMART LED TV, air conditioning, free Wi-Fi, telephone, mini bar, mini safe. Bathroom with a shower, hairdryer, cosmetic set. 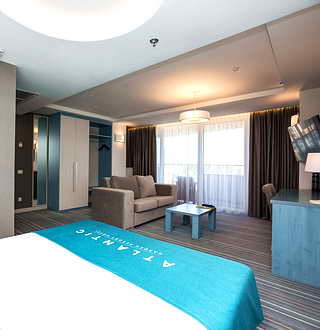 Оne room Junior Suite with Jacuzzi. 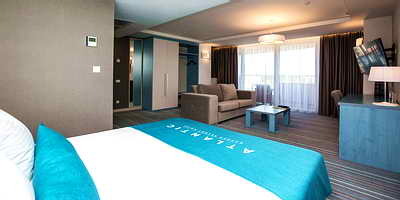 Double bed, folding sofa, a SMART LED TV, air conditioning, free Wi-Fi, telephone, mini bar, mini safe. 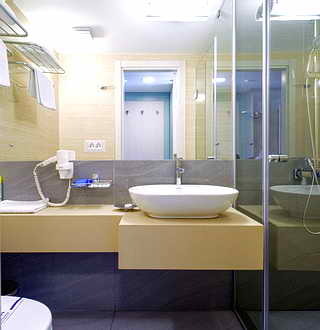 Bathroom with with Jacuzzi, hairdryer, cosmetic set, bathrobe and slippers. 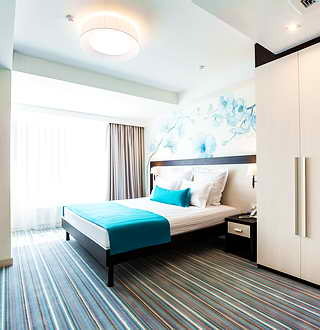 Spacious one room suite is divided into two areas: a recreation area and a sleeping area. 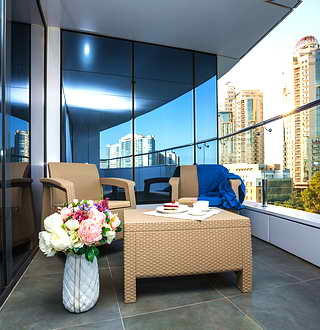 On the terrace, patio furniture and sea views. In the room double bed, large sofa that can fold out into a double bed, a SMART LED TV, air conditioning, free Wi-Fi, telephone, mini bar, mini safe. Bathroom a shower, hairdryer, cosmetic set, bathrobe and slippers. 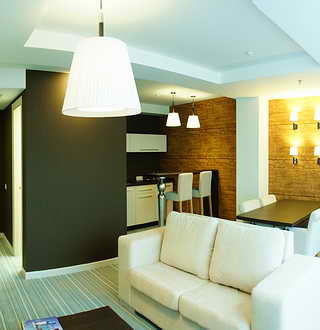 Spacious 2 rooms apartments consist of living room with fitted kitchenette and bedrooms. The bedroom has a double bed, in the living room folding sofa. 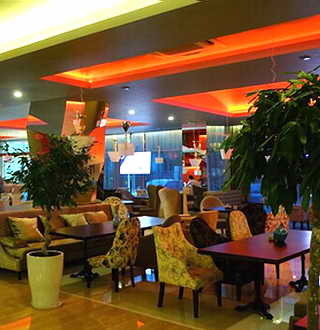 There is a SMART LED TV, free Wi-Fi, air-conditioning, mini bar, mini safe, telephone. Kitchenette with microwave oven, electric kettle, kitchen utensils. In the bathroom a shower, a hairdryer, slippers and dressing-gown. Breakfast is not included. It's additionally payed UAH 300 (USD 12). Tourist tax Дополнительно оплачивается туристический сбор 20.87 грн. с человека. 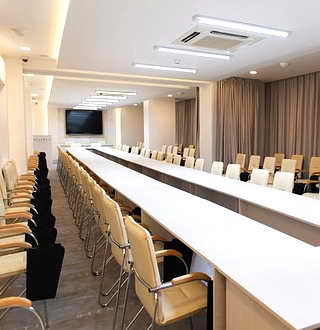 uah per person is not included in the room price. * The prices valid from 01.10.2018 till 01.05.2019. 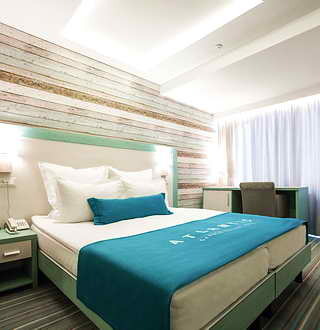 * Extra bed with breakfast for adult - 50% from room price. * For children up to 3 years old is available free cot. * Parking UAH 50 (USD 2) per day. Great new design hotel.The suite room with sea view terrace is wonderful!! 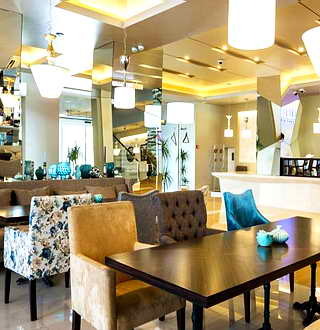 !Clean, comfortable, modern rooms.The stuff is polite and friendly! 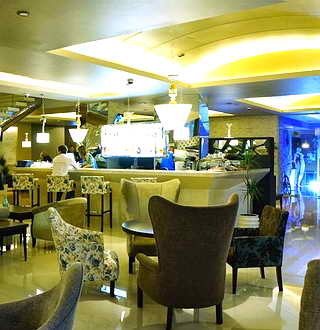 I liked Itaka beach club with 50% discuont for the gousts of the hotel. Keep it up!